Another away game and more points dropped as Madrid continue to toil on their travels this season. The manner of the performance will concern Madridistas particularly with the forthcoming Champions League tie against Man Utd, a two-legged affair in a competition which Madrid are now more or less basing their entire season around, the quest for la decima. A game which had minimal quality on display. Chances were at a premium with just three shots on target in the entire game. Normally a visit from the reigning champions would result in a capacity crowd for the home side. And when the reigning champions are struggling to recapture their best form and the likelihood of an upset is on the cards, you expect the sold out signs to be swiftly positioned. But this is La Liga where nothing is ever that simple. The cheapest ticket available was €90 and there were plenty of available seats. With clubs such as Osasuna receiving the scraps from the television table of Barcelona and Real Madrid, the visit of either of the big two is milked for all it’s worth with fans suffering a substantial hike in entry prices. A more equitable distribution of TV money is not a panacea for all of the financial ills of La Liga. But it would be an important step in the right direction. Sitting bottom of the table with just 14 points from their 18 league games this season, it’s strange to find yourself speaking positively about the Osasuna defence. Yet, their goal difference is a lowly -6. Only Atleti, Barcelona and Malaga have conceded fewer goals than Osasuna this season. As ever with a team coached by Mendilibar, Osasuna play a very aggressive offside trap, seeking to hold a high line and press their opponents deep into their half of the pitch. Madrid were caught offside eight times during the game as they eschewed a patient passing build up to their attacks in favour of a direct approach despite Ronaldo missing the game through suspension. Poorly timed runs coinciding with delayed passes meant the Osasuna offside trap worked very well for the majority of the game. When Madrid did break through, the opportunities were either wide or Andres Fernandez came rushing from his goal to clear, sometimes rather too impetuously. The problem for Osasuna arrives at the other end. No other team has scored fewer goals than the men from Pamplona. It’s a strange blend. The high defensive line enables a team to become a very compact unit but this is juxtaposed with the style they have in attack. Adopting a direct approach and favouring long balls, the side really needs a strong target man. Last season, that man arrived in the form of Lekic with Raul Garcia just behind him. Their departures have severely affected Osasuna and the game plan is no longer as effective. The defence will hold firm for the remainder of the season but if the goals do not begin arriving, Osasuna will drop into La Segunda. It’s a little sympathetic to say the jury remains out on the performance of Luka Modric since he joined los blancos from Spurs. With opinion polls in the local media rating him the worst acquisition of the season, Modric has struggled badly to capture any semblance of his previous form. This may in part be due to his role within the team not yet being defined. Is he the long term successor to Xabi Alonso in a deep lying playmaker role? Or is he to be deployed in an attacking midfield role, the central point of the attacking trident? Last night Modric deputised for Mesut Ozil. The German internationalist has created 52 chances this season, second only to Malaga’s Joaquin with 55 chances created to his name. Modric was replaced by Ozil after 67 minutes again leading to the question of why he is struggling to adapt to life in the Spanish capital. Modric is arguably a better technical player than Ozil with a greater range of passing. The problem is that’s not the sort of player Madrid need for the current system. Madrid need a player like Ozil who will drift laterally across the pitch, locating and exploiting pockets of space. Taking the position of the inverted winger who has moved centrally. The graphic below shows Modric passes during the game. 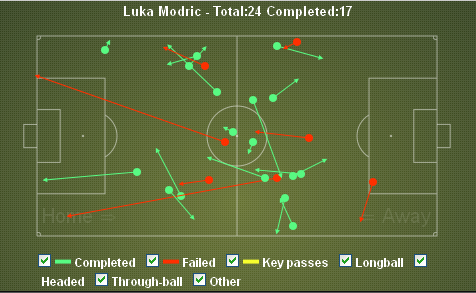 The Croatian was successful for 17 of his 24 attempted passes but too often he was deep. He had little impact whatsoever on the game. This was another opportunity for Modric that he failed to grasp. Part of the problem for Modric is that Madrid were far too direct last night. Being pressed by an aggressive opponent, Madrid resorted to fighting fire with fire and indulged in a long ball game at times. Los Blancos were successful with just 196 passes from an attempted 336. A pass completion rate of only 58%. Albiol hit a number of long clearances upfield which were swiftly returned by Osasuna. With the game being squeezed, Madrid took the easy option and launched the ball. Madrid often sat very deep with a low block, encouraging Osasuna to come forward in the hope of then quickly countering on a transition. It’s a very simple game plan and fails to utilise the skill set of the players within the team. Quite simply, Madrid have much better players than Osasuna. Match the workrate and determination of the opponent and it provides the platform for your technical superiority to shine. Madrid failed to do so. The dismissal of Kaka for two cautions, the second one somewhat farcical for a player of his experience, in the final 15 minuites of the game had little effect as the game drifted towards stalemate. With just one victory in their last four visits to the Reyno de Navarra, last season’s comprehensive 5-1 thrashing of Osasuna, Madrid knew they would be involved in a tough encounter but the lack of guile within their game was very surprising. Only two teams who were bottom of La Liga in the past ten seasons at the halfway stage have avoided relegation. Real Zaragoza and Osasuna. For Osasuna, whilst it’s a point gained in their relegation battle, Mendilibar must be thinking that come the end of the season, this game may represent two points dropped particularly if lightning fails to strike twice. I can´t understand why Mourinho wanted that they play such a direct game, it was obvious that it don´t work against the solid defensive line of Osasuna. Instead Modric in the centre of pitch rarely get a ball. In my opinion Real Madrid should slow down the pace of the game with using more of Modric and so get back Osasuna´s defensive line which were playing high and causing Madrid problems.